I had the sweetest moment yesterday as I sat with my daughter (Kate, who is 10) and a few of her cousins who are under the age of 8. I gave my daughter a stuffed lion that breathes (Perfect Petzz Lion) & shared with her the story of the lamb and the lion. The children gathered round and watched the lion breathe in and out. Jamison, 6 said, “Is it real?” I said, “no, but it does have a real story. Do you want to hear it?” These five little faces were set on my every word. I told them how at the beginning of time there was a beautiful garden and everything lived in peace. The lions laid down with the lambs, everything grew in beauty and light. There was a perfect peace that filled the land. I shared how the earth shook and everything changed once Adam and Eve took of the forbidden fruit. I then told them, but God promised that once again there will be peace across the land & that there is a great story right now in this day and time of a Lioness who has a heart of peace and love. They wanted to hear more. Although the phrase of “the lion shall lie down with the lamb” is one of the more popular quotes from the Bible, it’s really misquoted. 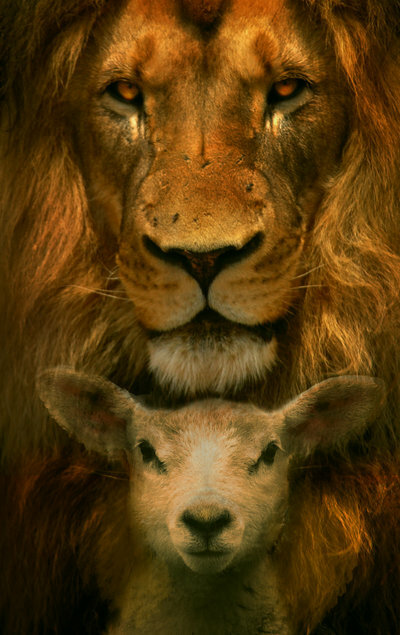 In the King James version, it’s the wolf that dwells with the lamb, and it’s a leopard that lies down with a kid, and “the calf and the young lion and the fatling together.” (Isaiah 11:6) But in today’s world, there really is a lion that lies down with a calf…in fact, she adopted and nurtured a total of five antelope calves. The Samburu people (Kenya) call her Kamunyak—the blessed one. So, the lesson in all of this…there is a lesson—that we all need one another and through that love we can have peace within our hearts. This holiday season I hope and pray for you to hold a place of peace and love wherever you go, with whomever you meet.